Recently, I needed an image of a traffic light that appeared to be lit up. I searched the 3D Warehouse and found a nice one uploaded by Manager. It appears to have been modeled by Andy Glucker and made available for free on FormFonts.com. To give it some definition and make it "pop" a little, I switched on shadows. There's a problem, though: lit-up faces shouldn't be able to receive shadows. Uncheck Receive Shadows to tell faces not to let shadows fall on them. I also made sure the underside of the "eyebrow" over the lamp didn't receive a shadow. To make it look like it might be receiving greenish light, I painted it a green-tinted dark gray. It's not a photo-rendering, but it works. Thanks for this great tip! 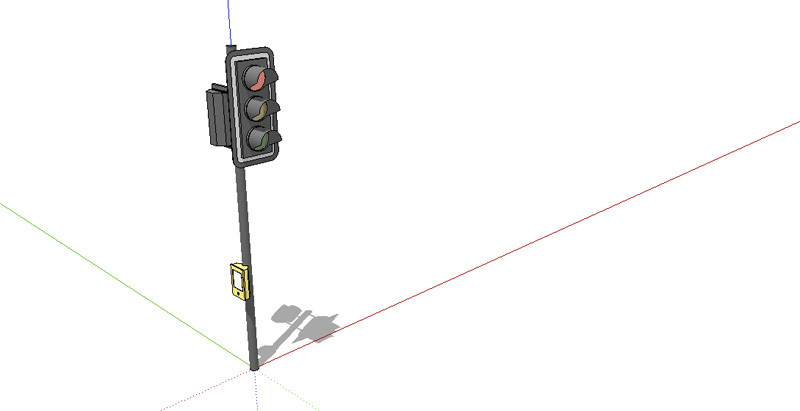 I enjoy learning new ways to use SketchUp and your posts are always interesting.